Al's first compilation album anywhere. The first Al product released exclusively outside of the United States. Oddly enough, the In 3-D album was not released in Japan, although the "Eat It" single was. 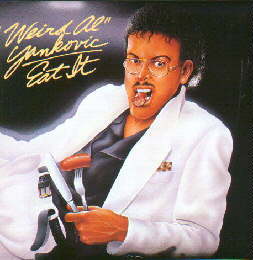 So to Japanese fans, the single was promoting this album (not to mention the follow-up compilation, The Official Music Of Weird Al). Since the compilation is a hodge-podge of songs from the first two studio albums (the debut album also didn't see the Land of the Rising Sun), the jacket credits also combine those from the albums. So, Al, Jon, and Steve are each credited twice for their performances. Liner notes contain the lyrics for "Polkas On 45" in English and Japanese. Printed lyrics for the polkas are rare to begin with, let alone on a compilation. See also The Saga Begins. Eat It ©1984, 1988 Scotti Bros. Records/Canyon Records, Inc. ©1983, 1984 CBS, Inc.